Articles Canned Cat Food and Dry Cat Food? Canned Cat Food and Dry Cat Food? The issue of whether to feed canned cat food or dry cat food is one that is very controversial. However, here are a couple of things to consider when deciding which cat food is best for your cat or kitten. Remember, that the quality of the cat food whether canned or dry is a huge factor as well. Cats that are prone to dental disease. Dry cat food, has some abrasive action on the teeth and slows down tartar accumulation on the teeth. However, without adequate water in a cat's diet, food can become stuck to teeth which causes tarter build-up. Additionally, inadequate water intake can lead to urinary tract issues as water is a huge factor in keeping a cat's organs and urinary tract flushed out. 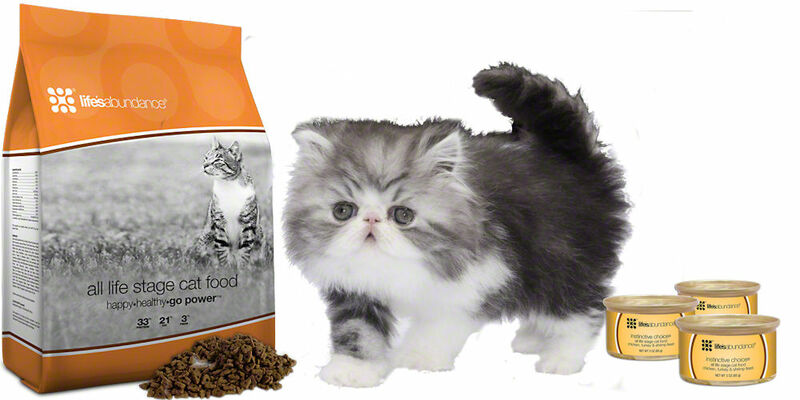 Dry cat food is good for underweight cats as dry food tends to have more calories than canned cat food. Cats that are nutritionally challenged or underweight, which need the extra calories, will benefit from canned cat food because the canned food has a stronger smell which entices cats. However, you have to feed more canned food (versus dry food) in order to meet a cat's nutritional daily requirements. Canned cat food has fewer calories and is better for weight loss. Cats with urinary issues do much better on canned cat food. Canned cat food is a sneaky way to get more moisture in your cat's diet which is good for proper bowel movement and to keep organs and urinary tracts flushed out. Dry foods are much more likely to lead to obesity in cats and it is the obesity that predisposes cats to diabetes. It is my experience that feeding a small amount of canned food in the morning, and sprinkling their daily supplement on it, and then letting the cat free-feed on the dry food during the day is what works best for our cats. I feel this is a reasonable approach as cats like to eat multiple small meals throughout the day. Additionally, the quality of the food whether canned or dry has much to do with your cat's overall health. Feeding a premium diet will benefit your cat. You feed less, and they eliminate less as there are no "fillers" that are empty calories. Fillers mean that you have to feed more of the food in order to meet the cat's daily nutritional requirements. A premium food will benefit your cat and its quality of life. I have fed Life's Abundance cat food for over ten years now. We recommend Life's Abundance dog and cat products to our clients desiring a better, healthier diet for their cat or dog.